Chorister Andrew Hunt writes about his quest to find out if Harry Stammers, the designer, painter and installer of the two windows in St. Elizabeth's Baptistry features Harry himself in one of them. Since 2006, I'd heard several people say in church that Harry Stammers the stained glass window artist, had included himself in one of our windows. Don't worry if you have never heard of him. Neither had I up until about 13 years ago. Despite him being the Stradivarius of the stained glass world, very little is known about him. Harry was rumoured to be the bespectacled gentleman in the left hand window called: 'Christ Child In The Temple'. The elder with glasses stands out, not just because he is wearing glasses (which clearly would not have happened historically), but he is evidently younger than all the other elders. I never thought much about it really, at first. There's also a female character wearing spectacles in the right hand window... 'Suffer Little Children' too! Maybe this was just one of Harry's quirks? After all this is the artist who painted a Hoover and a clothes peg in one window! And a football in another. Plus we must not forget the breastfeeding lady in a window installed way back in 1951. But as I read more and more about Harry in the excellent homage to him: 'The Stained Glass Windows of Harry Stammers' by Henry Hinchcliffe, I just had to find out more about Harry's connection with our church, and if it is he in one of our windows. Just what is the back story behind this unassuming but hugely skilled and forward thinking man who included spectacles on biblical characters? He was born in Limehouse, London on October 13th 1902. You won't be surprised to learn that he excelled in drawing and music. In later life, he was to play the organ and conduct choirs in his local church. In 1917, he got an apprenticeship with James Powell and Son, church furnishers. He joined their stained glass workshop as an apprentice draughtsman. His thirst for his craft was tireless - besides working during the day - he attended evening classes at St. Martin School of Art. He also learned from one of the most talented glass painters of that era, James Hogan, who was Powell's head window designer. In 1930, Harry married Grace Delamere, who was invaluable in bringing accountancy and admin skills when Harry formed his own Company in 1945. This was just after a brief spell with Wippell's Church Furnishers in Devon. The Stammers had moved to Exeter to be near their two sons, who had previously been evacuees. During the 1930s, Harry came to the attention of Eric Milner-White the Dean of King's College Cambridge and a leading authority on stained glass. Eric Milner-White had also been responsible for introducing the now world famous 'Festival of Nine Lessons and Carols' at King's College, Cambridge. 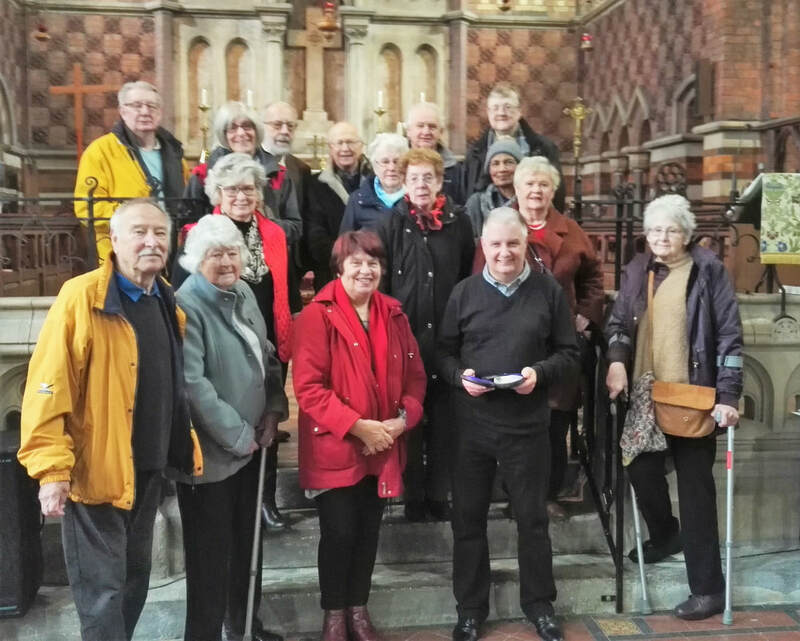 A service that many folk around the world see as the start of their Christmas and an event that celebrated 100 years in 2018. Eric Milner-White loved Harry's work, and this subsequently led to a commission for a new window at the Church of St. Mary the Less in Cambridge. This was possibly Harry's first solo commission. Eric Milner-White was to become Dean of York and in 1947 invited Harry to set up a glass painting studio in York, and help to revive an art that York had once been famous for in the Middle Ages. Eric Milner - White arranged a studio and living accommodation, so the Stammers moved and stayed there until 1960, nine years before Harry's death in 1969. 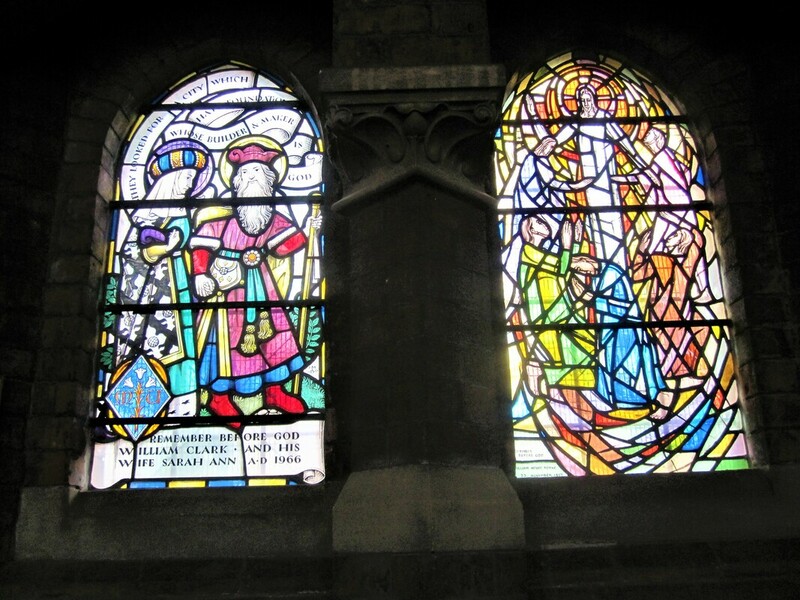 The two Harry Stammers windows in St. Elizabeth's are a memorial to John Hesketh and were installed in 1960. This was the year I was born and for some strange reason that makes me relate to these windows much more than the others in our church. They feature 'Christ Child in the Temple' and 'Suffer Little Children'. Harry has previously included himself in two windows at Pocklington School Chapel, East Yorkshire and the Church of the Holy Redeemer, York. But is he in ours? 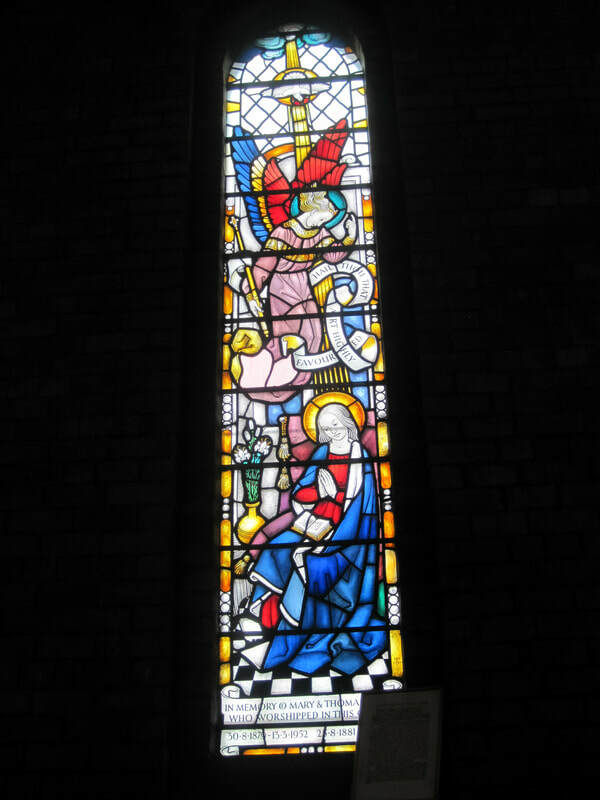 In his windows, Harry has included features that hadn’t been seen before in stained glass including a Hoover (St Michael’s, Croston), babies being breastfed as early as 1951 at St Andrew’s Bainton, an apple with a bite taken out, a Spitfire aeroplane, a farmer, an engineer, a typist, a football, a wheelbarrow and a wild looking woman on tambourine! People have been known to make a special journey to our church just to see these two outstanding examples of stained glass windows. 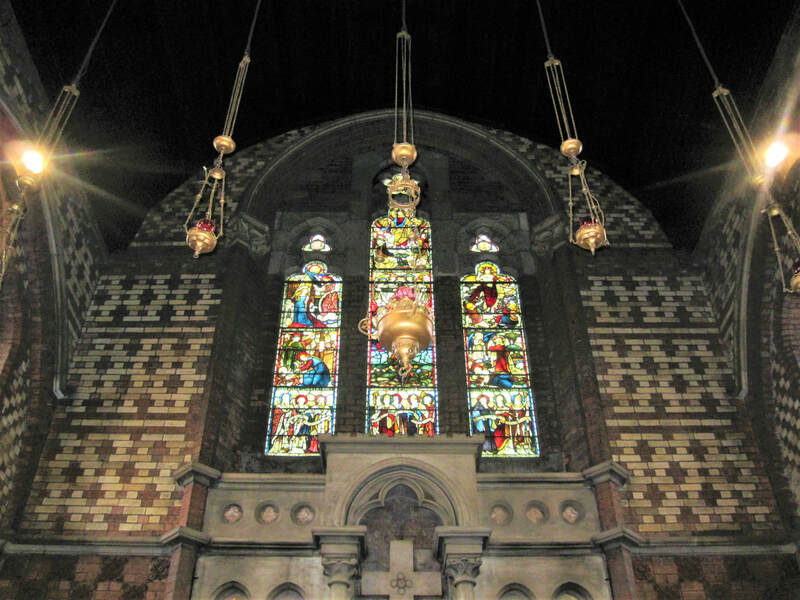 He designed 180 windows in his lifetime – ours are in good company with Salisbury Cathedral, Litchfield Cathedral, Hereford Cathedral, Lincoln Cathedral, York Minster, Glasgow Cathedral, Canterbury Cathedral and Seoul Cathedral and many other parish churches. His work is evident in two more Wigan churches - St Wilfred’s, Standish (1963) and St John’s, Pemberton (1967). But our church was the first in this region in 1960. His signature is always painted in the window, and is half cartwheel and half ship’s tiller (wheel). This is because his grandfather was a wheelwright and his father in law was a sailor. Above all, Harry Stammers believed in the Christian faith and his windows prove that time and time again. His windows show worshippers and many living things of God's creation. He was a humble man and hardly anything is known about him. What little we know appears to have been told by his wife. He just got on with his work. Harry didn't write any books or leave anything written down. Harry did his talking in his windows. 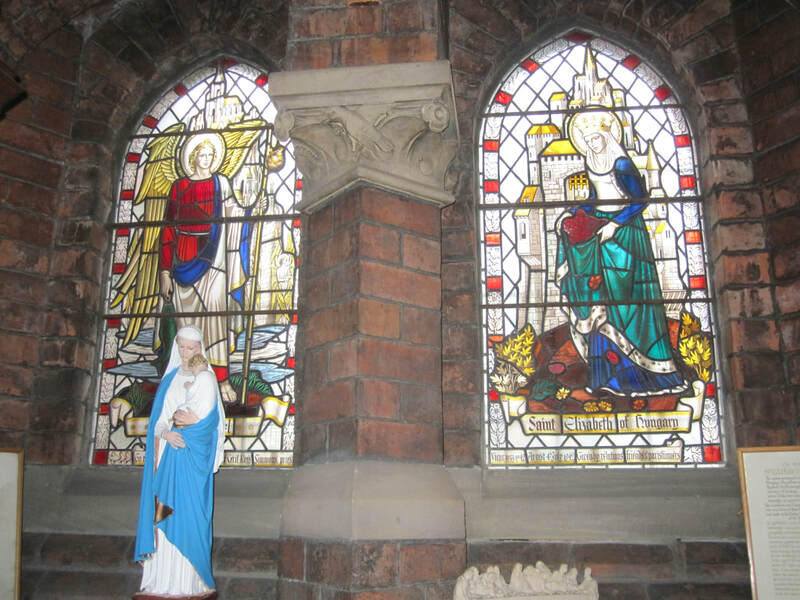 His legacy is 180 stained glass masterpieces, two of which have been installed here in Aspull. Thank God for that and the skill, craftsmanship and faith of Harry Stammers and his tireless service to the Anglican church. Sometimes he didn't even make any money on his installations. Harry introduced ‘modernism’ to stained glass and he has been described as ‘one of the greatest glass painters of the 20th Century’. Harry himself said ‘we work to the traditional lines of craftsmanship, but we are trying to express our own age in glass and not merely imitate earlier periods’. Is it Harry in our window? How do you set about proving if it is indeed, Harry in our window? I had never done anything like this before. In the end it was quite simple and the verdict was given in a couple of hours one wet Monday. In his book, Henry Hinchcliffe had provided an email address. So I sent him an email and waited. An hour or so after, confirmation was received in my in tray that I had the correct person. The expert. After introducing myself and my dilemma, Henry was more than happy to assist. Here's the evidence I sent. Harry had already proved in his book that the picture (left) was Harry. 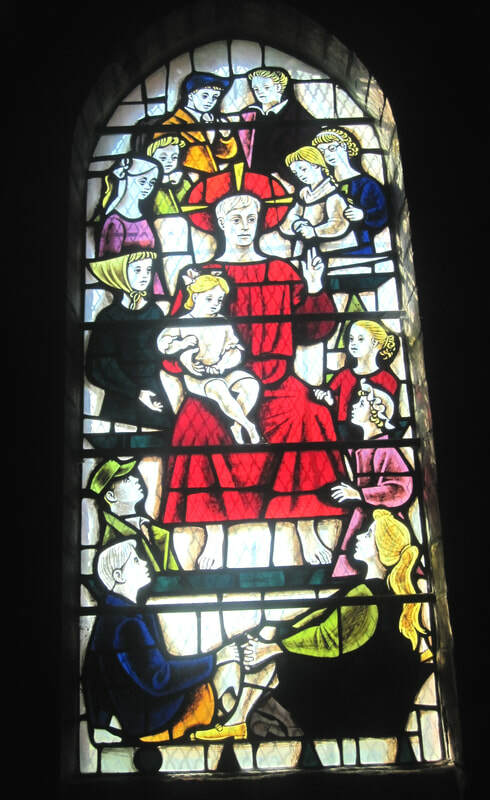 This picture is taken from a stained glass window at Pocklington School Chapel, East Yorkshire and is in Henry's book. So, what was the verdict of the expert, having considered all the pictorial evidence. Are all three Harry Stammers? "They could well be. The only argument against would be that it seems unlikely that Harry saw himself as an “elder” possessed of great wisdom, but he might have included an image of himself to add interest to his daily task, and the image is that of a noticeably younger elder compared with the rest of the group. 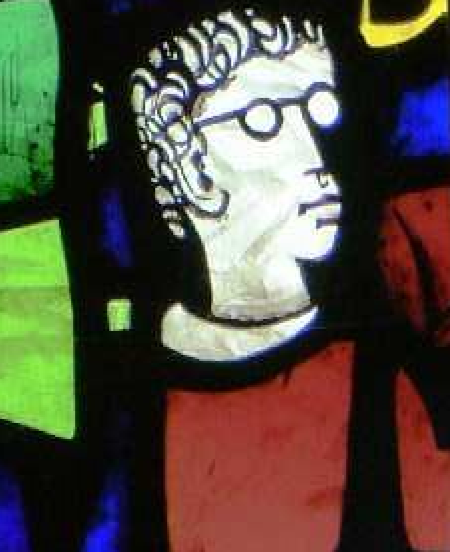 It was Daryll Buttery, who donated the Stammers window to Pocklington School Chapel, who suggested that the figure digging up his single talent in that window was Harry himself— there is a resemblance to a photograph of Harry taken at about the time the Pocklington window was made, a photograph showing him wearing the heavily-framed NHS spectacles which were standard issue at that early time of the NHS’s existence. I became convinced of this when I found that he had repeated the motif at The Church of the Holy Redeemer in York (see page 212 of the book) where the figure digging up his talent looks even more like your bespectacled elder at Aspull. It fitted also with the impression I formed of Harry as a modest, shy man with a gentle sense of humour who would have enjoyed making a self-deprecating joke about having buried his single talent and not made himself rich with it. So, I can’t say for certain whether your elder is a self-portrait, but judging by the spectacles and the resemblance to the image at Holy redeemer, York, I would say that on balance it probably is. Thank you for contacting me". If an esteemed expert such as Henry Hinchcliffe is saying this...I think we can say say that our man in the window is indeed, Harry Stammers! So, out of the 180 stained glass Harry Stammers windows in the world, there are only three with Harry included in them. And St. Elizabeth of Hungary, Aspull is one of the chosen few. So, why would Harry do this? The truth is we will never know. Sometimes we do things just because we can. In the stained glass world of Harry Stammers - anything could happen. And it frequently did! My research and findings would not have been possible without the personal help of Henry Hinchcliffe author of ‘The Stained Glass Windows of Harry Stammers’. Reading the book is a joy and when Henry personally answered my queries, I could not thank him enough. I would also like to thank Andrew Sackville of Cantique Chamber Choir. For it was Andrew who first told me about Henry's book in 2016. Without knowing about that book - my little quest would have failed! Indeed, it would never have started. Indeed, it is Andrew that has suggested that Harry's wife may be featured in the other window so I am going to follow that up if at all possible. Henry's book is available here. Here's a brief description of some of our stunning stained glass. 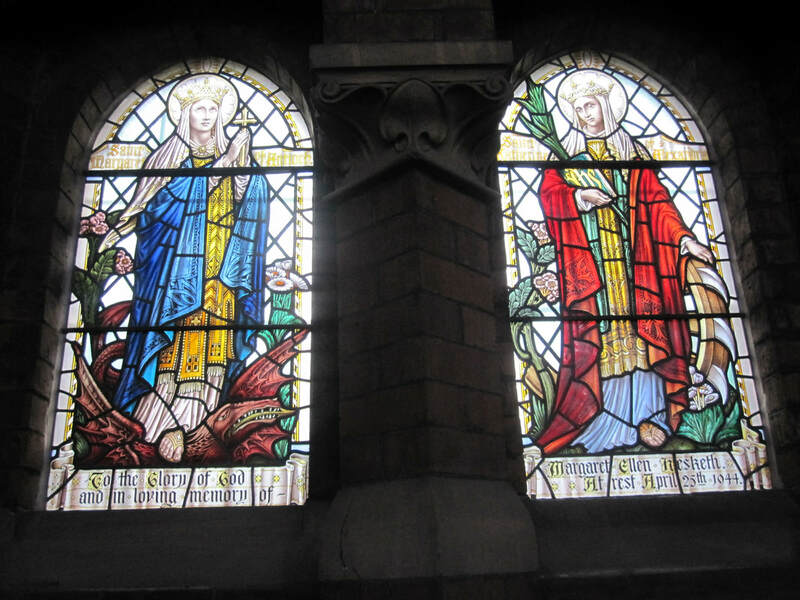 The second pair of windows on the south side commemorate the Mothers' Union and Christ in Ascension - also known as the Transfiguration. The designer of these two windows was Harcourt Medhurst Doyle (1913-2001). The third pair of windows on the south side of church feature St. Margaret the Virgin and St. Katherine. They were designed by Abbott and Company of Lancaster. The only single window on the south side of church is dedicated to Sarah Monks. Since 2018, it has formed a unique feature in our newly installed kitchen. We reckon that this makes the Sarah Monks window 'officially' the poshest kitchen window is Aspull! Unless, that is, you know different? 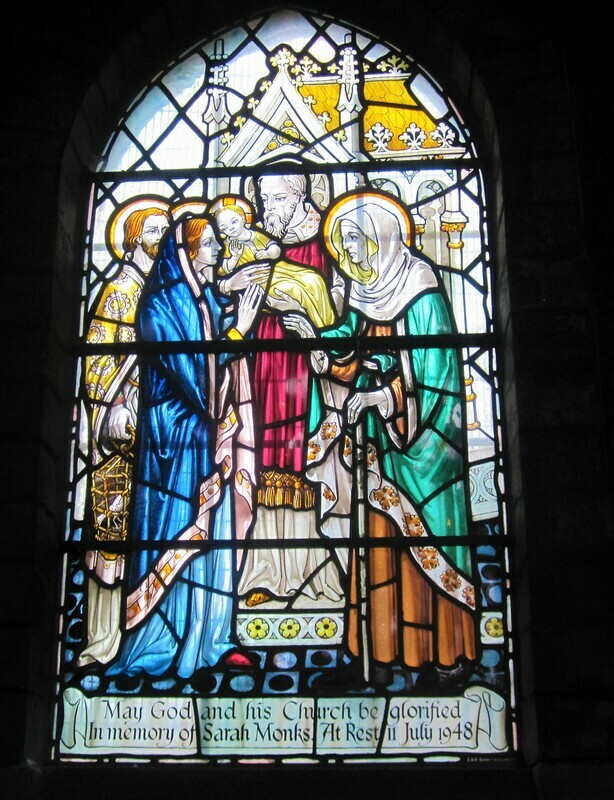 The sole stained glass window on the north side of church is dedicated to the memory Mary and Thomas Ryding, who were faithful in their worship at St. Elizabeth's for many years. Mary and Thomas's grandson David still attends our church, along with his wife Sheila. Installed high on the west wall of the church is the wheel/rose window. 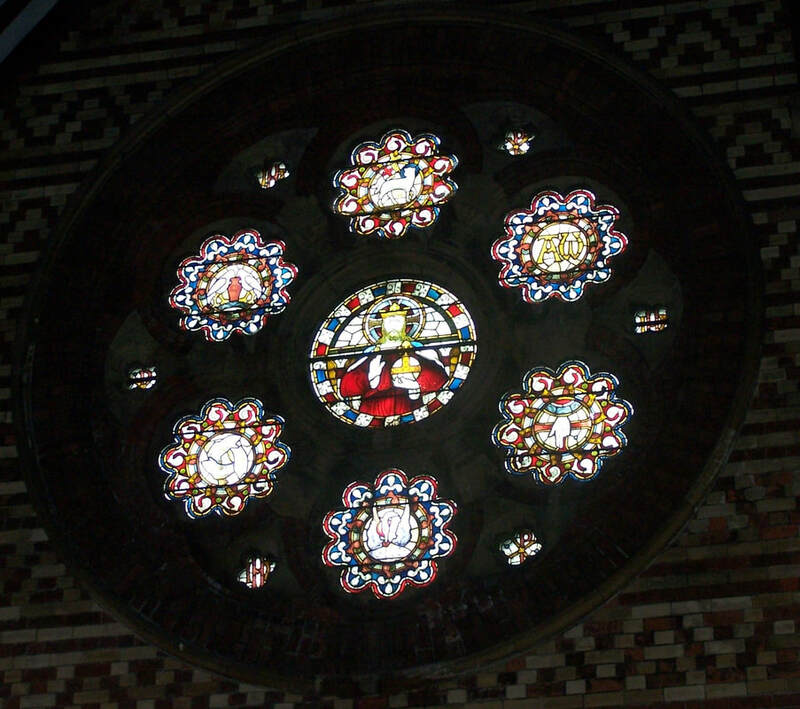 This type of window became popular in Norman times and are given the name wheel/rose window as the design is said to resemble the spokes of a wheel or the petals of a rose. Our spectacular window has recently been taken away to be completely renovated at a cost of £240,000. The renovation is being carried out by Design Lights, Blackrod, Bolton. The Chancel window is the largest expanse of stained glass in church. It is split into three sections depicting the birth, death and resurrection of Christ. Want to see our windows and other features in person? Why not book on our 'Talk 'n' Tour? Details here.